With Chevron Tiles, you can add aesthetic appeal, style, and a contemporary ambiance to your interiors. When you choose Chevron Tiles, you opt for precision, finesse, and exquisite craftsmanship that shows through in the finished spaces of your home. Add to the visual appeal of your floors and give the interiors a spacious look. We match the tiles to the decor of the room to enhance the overall look. Choose tiles for rooms, hallways, and stairways. Use tiles in different colors and patterns to highlight your bathrooms and kitchens. We also have a stunning collection of tiles to add sophistication and a contemporary look to your living room or bedroom. Distinct from the Herringbone pattern, the Chevron style first emerged in Greece and has been used in Roman architecture also. In present times, designers often add it in Art Deco and fashion textiles. We undertake tiling projects for your entire home with options to match the decor of each room. Check our collection of materials, colors, patterns, and styles that blend perfectly with any room ambiance. At Chevron Tiles, we understand the significance of beautiful and stylish tiles for the aesthetic appeal and ambiance of your interiors. Floor or wall tiles not only put in the finishing touches to your decor but they also say a lot about your personality and who you are. Not to be confused with the Herringbone style, Chevron as a pattern emerged in Greece. Builders and architects have used the pattern over the centuries with the latest adaptation in Art Deco designing and fashion textiles. We specialize in the Chevron pattern because of the exquisite, retro-themed interiors we can create with it. We invite our clients to choose from an immense range of prints, colors, and textures that are available in our Chevron Tiles collection. With Chevron Tiles, you can add aesthetic appeal, style, and a contemporary ambiance to your interiors. 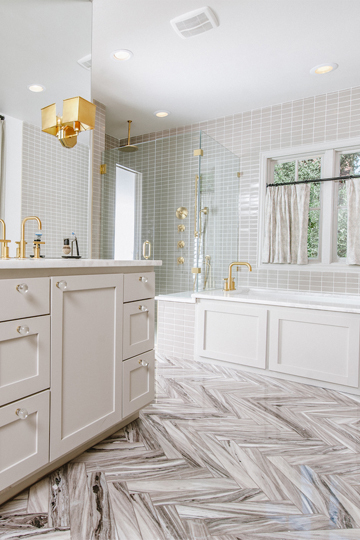 When you choose Chevron Tile projects, you opt for precision, finesse, and exquisite craftsmanship that shows through in the finished spaces of your home. Pick out the Chevron tile materials you would like to adorn your home with whether ceramic, wooden flooring, marble, granite, mosaic, stone, clay, slate, or any other. Aside from floor tiles, we also undertake projects for installing floor tiles in rooms, stairways, and exteriors. Go ahead and choose the perfect Chevron tile colors from our extensive catalog to match every rooms and interior. By relying on Chevron Tiles, you can expect innovation, creativity, and outstanding efficiency to bring the project to completion with artistic precision and finesse. All of our team members take pride in their work and treat each project like a work of art. And, that’s the kind of dedication and attention to detail that shows through in the finished product. At Chevron Tiles, we’re all about high standards and the best of craftsmanship! Would you like more information about Chevron Tiles? Or, maybe you’re just looking for a consultation. How about calling us on this number (661) 450-6752? Our agents are on standby and will answer your queries. You can also contact us by adding your details on this form and we’ll get back to you.